The Albertan government has released a renewable electricity programme (REP) laying out plans to increase its share of renewable electricity to 30% by 2030. Under the plan, the province plans to add 5GW of renewable generation, requiring C$10 billion (US$7.52 billion) of private investment by the end of the next decade. The government said roughly 10% of its current electricity generation is from renewable energy sources. 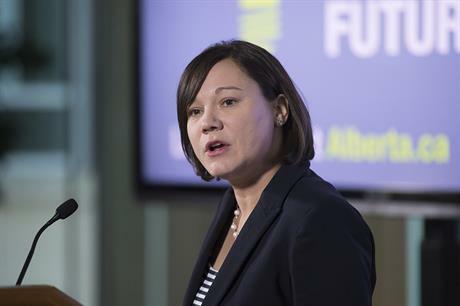 "By laying out a more detailed, long-term plan for renewable power, we're strengthening Alberta’s position as a leader in renewable energy while providing certainty for private investors, communities and First Nations," said Alberta’s minister of environment and parks, Shannon Phillips. The Alberta Electric System Operator has been directed to "develop recommendations" for a fourth renewable electricity auction, to add 400MW of renewable electricity. The previous three rounds procured more than 1.36GW of wind capacity for prices between C$30.90/MWh and C$41.49/MWh (US$23.23-31.19/MWh). Rounds two and three were awarded in December 2018. Further details for the fourth auction round is expected in mid-2019, the government said. "Long-term planning provides our members with the stability needed to make investments that will unlock the lowest-cost electricity for ratepayers and provide long-term benefits to landowners and their rural communities. "By 2030, this could result in over C$3.6 billion in project spending in the province, along with C$25.5 million in property tax and C$13.5 million in land lease payments every year," said Evan Wilson, regional director at trade association CANWEA.